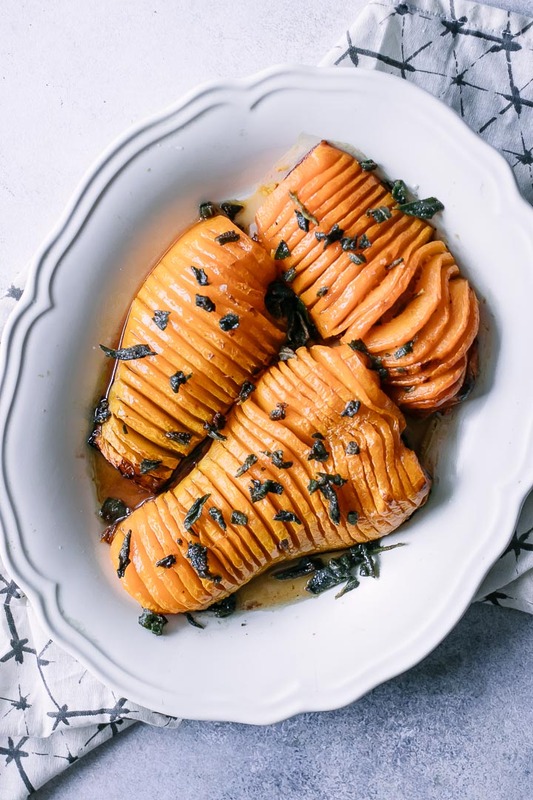 Brown Sugar Sage Hasselback Butternut Squash | 5 Ingredients, 60 Mins! 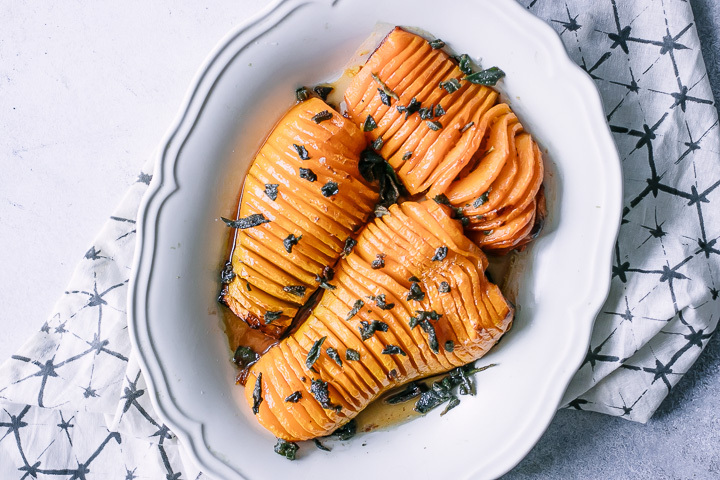 Brown Sugar Sage Hasselback Butternut Squash, a simple roasted butternut squash recipe cut “hasselback” and topped with browned butter, brown sugar, and sage. A perfect fall side dish! Are you a fan of hasselback recipes? I can’t get enough of stuffed hasselback baked potatoes and have even gone as far as hasselback-ing pears in this Hasselback Fall Fruit Platter. But when my eye caught a recent Bon Appetit magazine recipe featuring hasselback butternut squash, I knew I had to try. While butternut squash in and of itself is a vegetable that screams fall, I topped it off with a bit of browned butter with brown sugar and crispy fried sage. It doesn’t get more autumn than that. 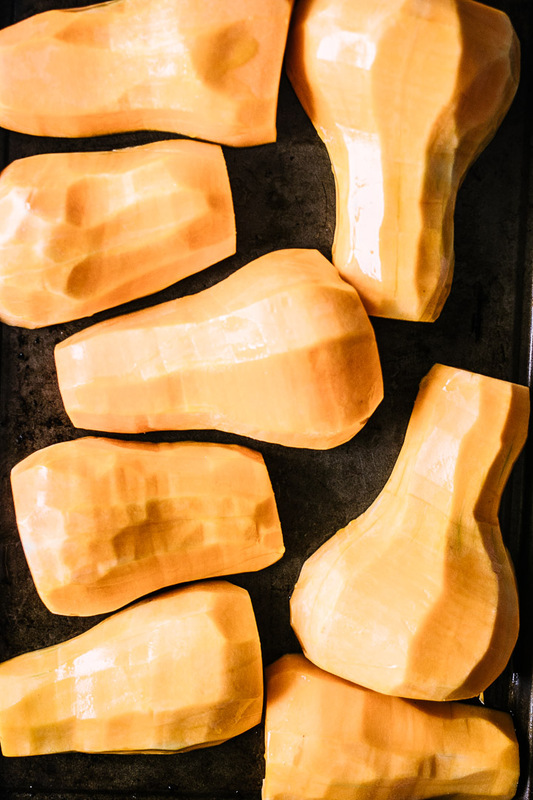 Ready for the so-simple 5-ingredient, under 60-minute hasselback butternut squash recipe? Let’s do it! 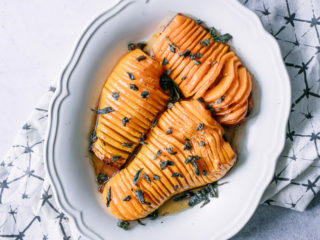 “Hasselback” refers to thinly slicing a food about 75% through, so that the food — like a potato or even a fruit, like an apple or pear — can roast until crispy, usually stuffed with herbs or breadcrumbs. Butternut squash is one of my favorite vegetables to hasselback, as its beautiful orange color is a definite crowd pleaser. To start, “hasselback” your squash by first cutting it in half, removing the seeds, and peeling the outside skin. Bake the squash halves for about 20 minutes and then, using a very thin paring knife, cut small slices in the squash until about 75% through. Allowing the squash to bake first will make the squash easier to cut and prevent you from accidently cutting it all the way through. Next top the squash with a browned butter with brown sugar glaze mixture (see “how to brown butter” below), and alternate baking for 15 minutes with more glaze. The squash is done when it’s soft, yet browned, throughout. Serve immediately (or else the soft squash may “deflate”) topped with sage or other toppings (nuts like pecans and walnuts are great options). I hope you enjoy this simple butternut squash recipe! For more simple autumn-inspired sides check out our Maple Mustard Roasted Brussels Sprouts and Butternut Squash Cranberry Kale Salad recipes, both fall vegetable side dishes that are perfectly seasonal. 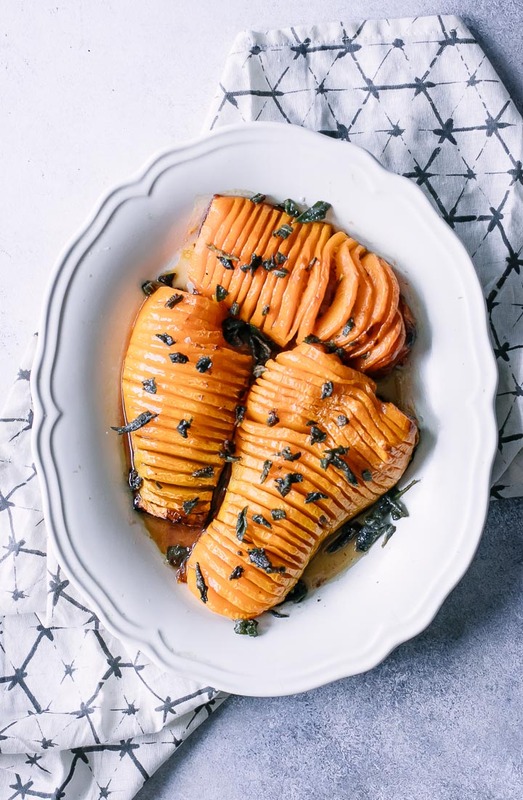 Did you make this Brown Sugar Sage Hasselback Butternut Squash recipe? Leave a comment below and rate the recipe to let us know how it turned out. 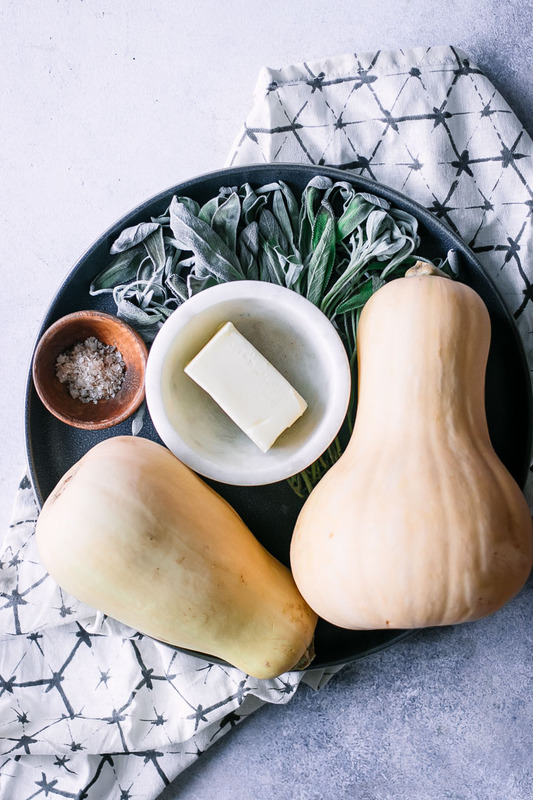 Save this recipe for later by pinning to your favorite fall Pinterest board and make sure to tag me on Fork in the Road’s Instagram to show me your squash creations! Preheat oven to 475. Place squash halves face down on lightly oiled baking sheet and roast for 15 minutes (do not “hasselback” the squash yet). Meanwhile, heat a medium-sized saucepan over medium-high heat. When pan is heated, add stick of butter and cook until it begins to brown and releases a nutty aroma, about 4 minutes. Add brown sugar and cook until dissolved, about 1.5-2 minutes more. Finally, add sage slices and fry in butter until they start to harden, about 1minutes. 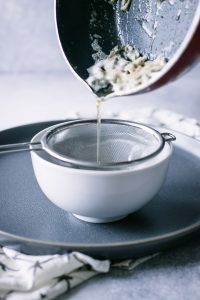 Remove pan from heat and pour butter through a strainer to remove sage. Remove squash from oven and, using a thin paring knife, make small slits across the back of the squash, making sure to stop the cut about ¼ inch above the bottom. Top with browned sugar butter mixture and add back to oven for 15 minutes. Cook for 30-45 minutes more, or until the squash have released water and begin to brown, removing squash from oven to brush on more browned sugar butter every 15 minutes. Remove squash from oven, let cool slightly, and then transfer to serving platter. Top with the last of the browned sugar butter and the fried sage before serving. Notes: to prep butternut squash, cut off bottom rind and top stem, then stand upright and peel outer skin. Then scoop seeds and flesh with a melon peeler and finally cut in half lengthwise. Leftovers and storage: to prep, peel and cut squash the day before and keep in refrigerator until baking. To store, place squash in airtight container and refrigerate up to five days. Nutrition: This butternut squash recipe is high in vitamin A, potassium, and vitamin C. It is high in fat due to butter, however if you are plant-based or want to reduced the saturated fat then substitute with vegan butter or oil. 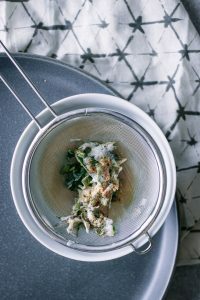 I tried this for a dinner party with friends and it was really good. I got really big butternut squash so I didn’t have a problem with the slices losing shape. Everyone thought it was a really good idea. I’m you enjoyed it! It is definitely a crowd pleaser because of its unique presentation. Thanks for stopping by!